Adopt A Highway Maint. Corp. 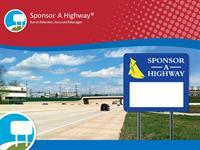 Sponsor A Highway Inc. Adopt A Highway Maintenance Corporation® provides companies the opportunity to brand their name and logo while supporting the community their customers live and work in. We do all the work, while your company gets all the positive recognition. Signs are displayed on America’s busiest highways, offering our sponsor’s businesses positive exposure 24 / 7 - 365 days a year.